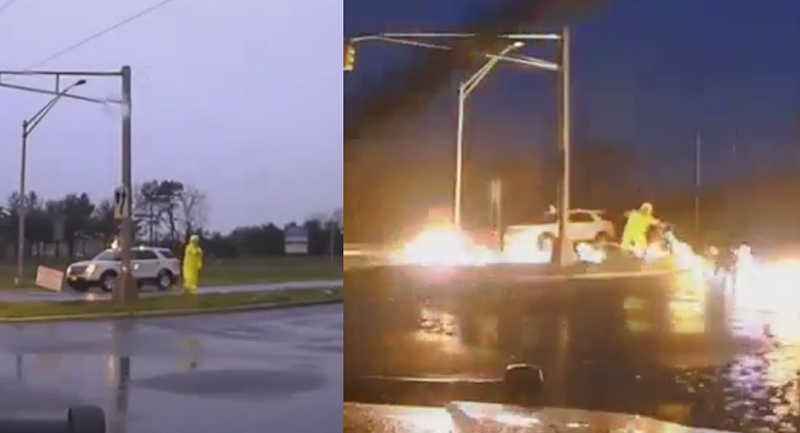 A New Jersey utility worker is lucky to be alive after one miscalculation caused a downed wire to spark and catch fire earlier this week. Responding to a traffic light outage on Highway 70 in Manchester, New Jersey, the worker, who believed the wire was de-energized, is first seen tugging at the cable wrapped around a light post. Seconds after freeing the wire, the live line touches a puddle, sending the immediate area into flames and the worker running for his life. "At the end of the night, no one was injured and everyone made it home," the Manchester Police Department's Facebook page noted in their posting.